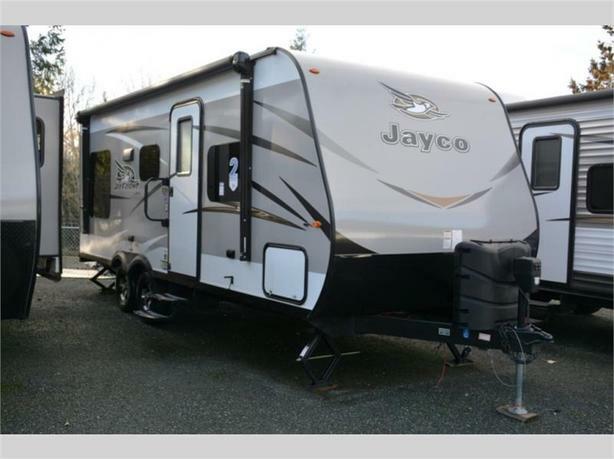 If you are looking for a fun time away from the hustle and bustle of life with your family of four, then choose this Jay Flight 21QB travel trailer to enjoy the simpler life in! In this model, you will find a front bedroom which features a 74" queen bed, two wardrobes, and an overhead cabinet. At night close the curtain for a bit more privacy from the rest of the trailer. Almost straight in from the entry door is the bathroom which features a tub/shower, sink, medicine cabinet, and a toilet. To the left of the entry door, there is a double kitchen sink, three burner range, microwave, and overhead cabinets for dishes. Across from the range is where you will find the refrigerator and pantry. Enjoy meals at the dinette, and across from the dinette, there is a sofa. Both the dinette and sofa feature an overhead cabinet, and both offer great seating options during the day, and at night these can be used for additional sleeping spots. Outside there is a 16' awning as well as front storage, and so much more!